We have a brand-new mesh fountain with incredible detail and an amazingly low prim count that is sure to spice up your outdoor decor! 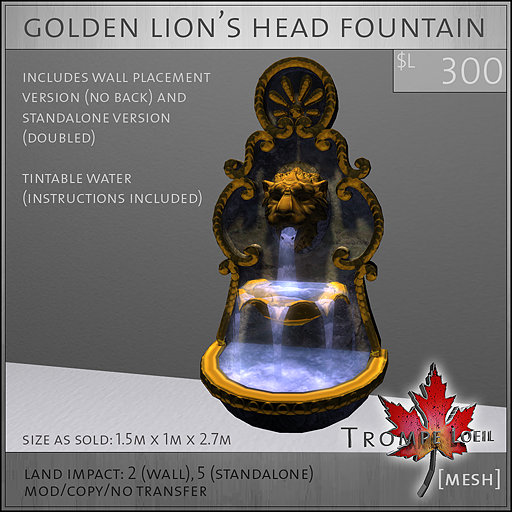 This mesh fountain is fully baked and includes tintable animated water (instructions included), and the package includes a wall version (no back faces) and a standalone version (a doubled copy of the original fountain, back to back). Both versions are incredibly low-prim and mod/copy permissions means you can adjust the size and scale to fit any decor requirement! The Wall version is 2 prims and the Standalone version is 5 prims. You can see and purchase this item in person at Trompe Loeil inworld, or on the Marketplace for easy shopping! New for Stumblebum – Curve and Loop patio furniture sets!